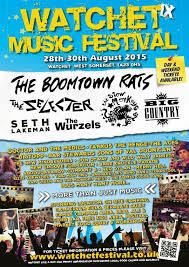 Doctor and the Medics join the fantastic The Boomtown Rats, Big Country, The Blow Monkeys and many other fabulous bands at the Watchet Music Festival on 28 August. Watchet Festival returns for the 9th year over the August bank holiday weekend 28-30th 2015. Any ticket purchased via We Got Tickets will be in the form of an E Ticket! These will remain on sale on this site until Thursday 26th August or until stock run out. A Limited amount of “Weekend / day tickets” may be available on the entrance gate each day until early evening (or whilst stocks last) after this time only ticket holders will gain access to the festival site.